My love for dukkah started 7 years ago on my last trip to Perth in 2008. I had my first taste at one of the winery restaurants. This is something that I always have in my pantry. On lazy days for dinner, we would have toasted slices of walnut bread (a staple in our the freezer), with Olio Bello extra virgin olive oil and dukkah. This is great as a starter before dinner. There is just something magical about this trio combination; the grassy olive oil, the nutty cumin spiced mixture and crusty bread. Surprisingly, I never attempted to make a batch till this trip. I was all ready to buy my whole year’s supply! Enjoying it at the Voyager Estate with good olive oil and fresh crusty bread during our fourth day in Perth inspired me to make my own batch. Having looked at the ingredients, I thought this could not be too difficult. So here goes my version filled with pistachios, almonds and cashews. Preheat oven to 200 C for 20 minutes. Roast nuts and sesame seeds in the oven separately till golden brown. If using macadamia nuts, watch them as they roast quicker than almonds or hazelnuts. Set aside. Toast the coriander and cumin seeds in the dry pan to get the maximum flavours out from them. Watch them closely and do stir them constantly. Do not add oil. Set aside. 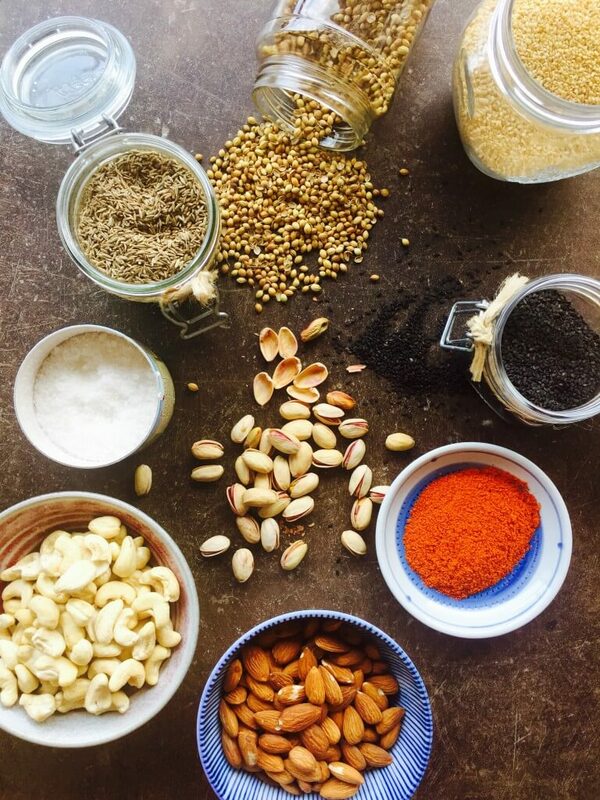 Put coriander and cumin seeds into food processor or a coffee grinder and pulse. Omit this step if you are using the ground version. Add nuts, ground to coarse consistency. Add salt. Remove from food processor and add the sesame seeds and mix briefly. 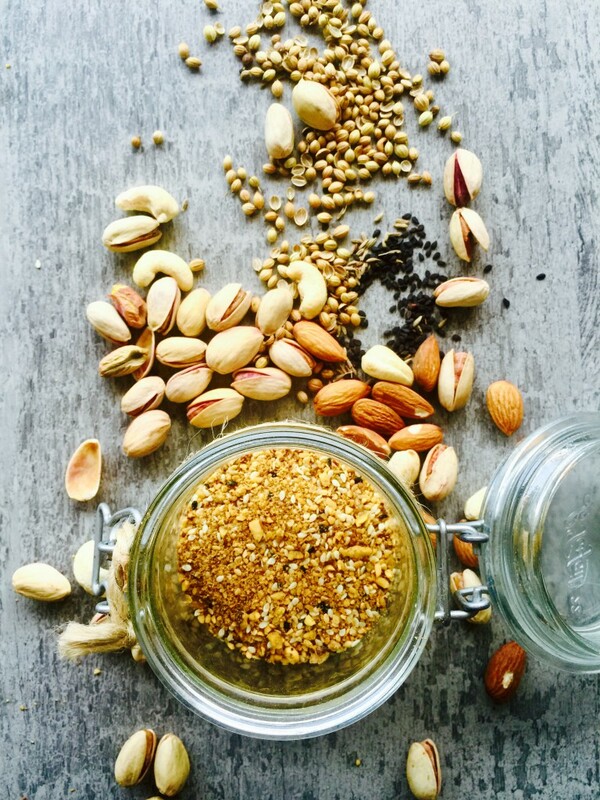 Store dukkah in airtight container or jar at room temperature. I store mine in the fridge to extend its shelf life. Please do ensure a dry spoon is used to scoop the dukkah from its container. You can substitute with ground coriander and ground cumin if you can’t find the seeds. Toast them in a dry heated frying pan before using to ensure maximum flavours released. You can use macadamia nuts, or hazelnuts if you like. You can play around with the nut ratio depending on what you have and what you fancy. This is a great condiment for my Chunky Shakshuka recipe and as a condiment for soups like chowders, a topping for salads.